Since I retired from full-time teaching at Ohio University in 2007, fly fishing in its varied guises and dimensions has become increasingly a kind of habit of being, a personal identity marker, an alternate way of apprehending the world. In Upland Stream: Notes on the Fishing Passion, W. D. Wetherell lists thirteen reasons why human beings fish, all of them plausible and informative, but the fact is we probably do it for a hundred other different reasons, too, and my guess is that, among them, we love the intimate process of fishing, the simple rituals and preparations associated with the act, the tactileness and physicality of the equipment, the freedom and challenge of being on or near the water, the adrenaline rush and sense of well-being that comes from doing something for ourselves outside the ho-hum work-a-day routine. And last but not least there is the pleasure of recollecting that time on the water. 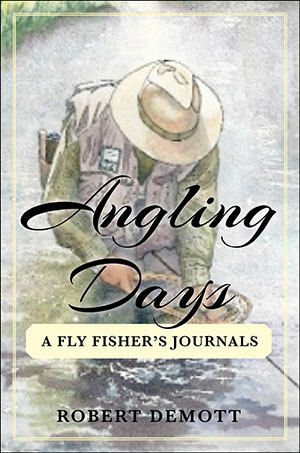 Among the unalloyed blessings of traveling in Fly-Fish Nation is that when I am not actually fishing forty to fifty days a year, I am equally happy to be reading about it or, if I really want to stretch myself, to be writing about it. Directly or indirectly, whether with rod or pen in hand, I find myself, especially as I pass into old age, spending an inordinate part of each day invested in fly fishing and its related forms of memory, thought, word, and deed. These conglomerate forms of fishing strike me as being of imagination all compact and create a particular angle on the green world. I admit I can’t pass by a river without wondering whether it is as healthy as it should be, whether it holds trout, whether its insect hatches are bountiful and easy or difficult to imitate, and whether I’d be happier living near it than somewhere else. Daydream stuff, fantasy stuff, but a tolerable momentary respite from (if not an actual rebuttal to) an increasingly politicized, dehumanized, technocratic world, which, now that I think of it, is probably the same “modern” world we’ve been living in and bemoaning for the past 200 years, but which recently appears somehow to have gotten more egregious, poisonous, and fractious. “We fly-fish in part,” Chad Hanson says in Trout Streams of the Heart, “because we all harbor a sense of loss.” In that case, we yearn for something better and different, something restorative. But like most other deep-seated cognitive patterns that veer toward passionate and even obsessive compass points, this angling stance is at best a paradoxical one, discovered as the fisher fishes. For me, the appeal and power of a fly-fishing purview—if I can give a name to the thing that has colonized my imagination for more than five decades—comes from a lapidary space where cross currents mix and mingle in their at-onceness. Fly fishing can be at turns conservative and avant-garde, naïve and critical, active and reflective, practical and aesthetical, pedestrian and lyrical, pristine and invasive, artificial and natural, experiential and literary, commodified and romantic, brutish and spiritual, misguided and dead-on. Although binaries sometimes cancel each other out, living in these paradoxes strikes me as a thoroughly agreeable condition that keeps me on my toes. “Fish and find out,” British philosopher A. A. Luce advised in Fishing and Thinking. In other words, we pay our money and make our choices: we believe in catch and release, but every so often we like to eat what we catch. Sometimes John Keats’s unheard melodies are sweetest, sometimes not. After all, best not to forget that, with so many fly-fishing apps downloadable to our smartphones and electronic devices, and with video logs, glossy photo mags, fly-fishing film tours, and angling blogs proliferating at an unheard-of clip, these probably are the good old days for many people. But once an English prof, always an English prof. Whipping the water with a fly rod is one half of the fun. The other half is reading and writing about it. The latter impulses connect to a stained-glass window marking Izaak Walton’s burial site in the Chapel of St. John the Evangelist (aka Prior Silkstead’s Chapel) at England’s Winchester Cathedral: the old master himself with a book in hand, lounging bankside among his fishing paraphernalia. “Study to be quiet,” the window’s legend reads. The words, from the First Epistle of St. Paul to the Thessalonians in the New Testament, are also the concluding words of Walton’s Compleat Angler.